Fourth Row Center: Film Writings by Jason Bailey: In Theaters: "Pina"
The subject of Wim Wenders’ new documentary is Pina Bausch (1940-2009), the German modern dance performer and choreographer, but we don’t learn all that much about her in the strict sense—there’s little in the way of facts, dates, personal details, and the like. What we discover, over the course of Pina, is a sensibility, a way of seeing the world and a way of working to convey that sensibility. There are some archival clips, shown running on a 16mm projector. There are testimonials from the dancers who learned from her, but they are stylized and brief. The bulk of the film is about her work—the dance pieces that she created and often performed in, which are presented here in a manner that is exciting and ingenious. Part of that ingenuity comes from Wenders’ employment of 3D, a device that your reviewer was just as resistant to here as in any Hollywood blockbuster. Yet Wenders proves—as Herzog did with Cave of Forgotten Dreams, or Scorsese with Hugo—that it is not about the technology, but who wields it. 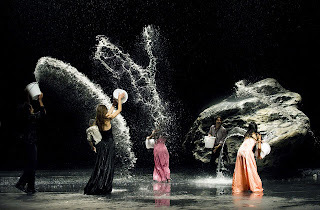 His big, wide shots of Bausch’s full-company numbers take advantage of the multiple dimensions; his use of subjective point-of-view is sparse but effective, combining with the technology to place the viewer in the midst of the action. Indeed, this is not a recording or even documentation of these dances—Wenders’s camera is an active participant, the delicacy and nimbleness of his tracking shots rendering the pieces vibrantly alive, the cameraman becoming as much a dancer as those in Bausch’s company. A few of the scenes are done on stage, though not always with an audience present; the cameras also take the dancers off-stage, using an entire cityscape as their venue (public transportation, parks, squares, factories, even a busy intersection). Pina plunges us right into the dancing without much in the way of setting the scene. He wants to engage us first, and then slowly fold the documentary elements in. Bausch is seen and heard, briefly, in the old clips; her sound bites are purposefully enigmatic (“All you can do is hint at things,” she explains). She lets her dancing (and her dancers) speak for her. Wenders makes one serious mistake. The interviews with members of her company—many of whom have been with her for decades—are done as voice-over, the audio bites accompanying the image of the dancer gazing silently into the camera. It feels like a director tired of the standard “talking head” framing and attempting to do something different, but it just doesn’t work; several of the subjects end up “acting out” their thoughts rather broadly, and Wenders trots out the trick of a false interview (cutting to the dancer staring soulfully, then cutting back to their dance before they say anything at all) a time or two too many. After a while, we begin to resist the interviews altogether, less because of the fatuousness of their commentary (“What is honesty?” asks one) than because they’re cutting away from the dancing. We’re less interested in the words, if you will, than the music. The dancing is simply too extraordinary to depart from—and this is coming from someone who, plainly put, does not really “get” modern dance. But you can’t argue with the beauty of these scenes. The opening number is, quite literally, earthy—a sequence simultaneously dirty and gorgeous. “Full Moon” is loose, funny, and evocative, a thrilling and funky escape. “Café Muller” is harrowing and nearly as exhausting for those watching as those onstage. And I can’t even fathom how they do that thing with the steadily-building stack of chairs. The most remarkable sequence presents a line-up of boys and girls in a school gym setting, all dressed up in their suits and pretty dresses, as if gathered for a chaperoned dance. Slowly, masterfully, they are replaced by their middle-aged selves, and then their elderly counterparts. As the scene plays, it gets at something real and distinct yet indescribable about growing old, about recognizing who we were, who we are, and who we will become. Good dance asks those questions and provokes those thoughts. Pina occasionally stumbles, and is just a hair too long. But it is powerful and intelligent, and is, above all else, aesthetically astonishing. "Pina" opens tomorrow in limited release.